Press play to learn more about what we offer Employers. Finding the right fit is crucial for your company. As an employer seeking excellent graduates, you have come to the right place. This is not just a university. This is a place where anything is possible – where dreams are born, and where the best employees of the future are nurtured. It all starts here. Career Zone to advertise your vacancies. Career fairs where you can exhibit your company, meet and talk to students, promote employment opportunities, generate interest in forthcoming recruitment activities, and raise the company profile on campus. This year we introduce the Science Fairs. The Career Guide in which to showcase your company and provide industry insights. Employer presentations as a platform to talk to students. Employer consultative workshops give academics and employers the opportunity to learn from each other with regard to strengthening existing links between the workplace and the University, and the responsiveness of the University’s curricula to workplace needs. You reap the benefits of ploughing back insights and industry expertise into education, while helping to build the nation. 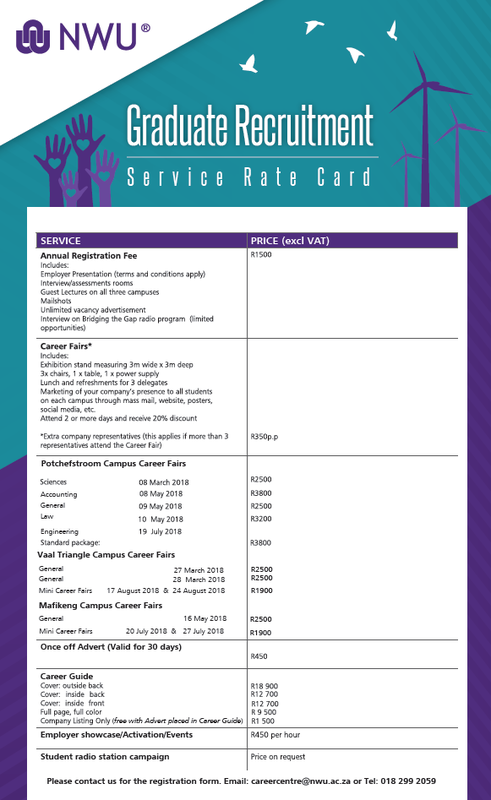 View our Rate Card 2018 and contact us about these and other opportunities to engage with potential future employees.